Happy Friday the 13th! 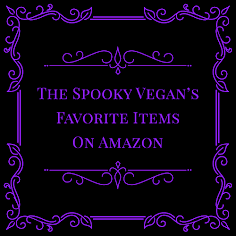 I have a spooky treat for you today to celebrate! 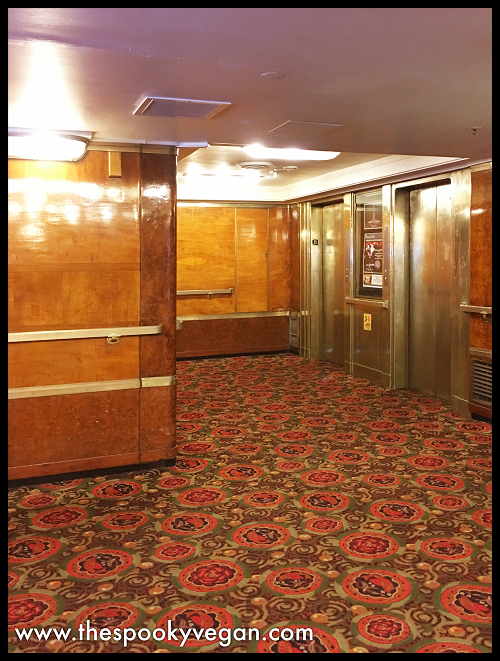 The Queen Mary recognized as one of the most haunted locations in the world, and with its history it's not hard to see why. From a luxury cruise liner to being utilized as a troop transport ship during World War II, where she was known as "The Grey Ghost", the grand vessel has seen her share of both glamour and tragedy. 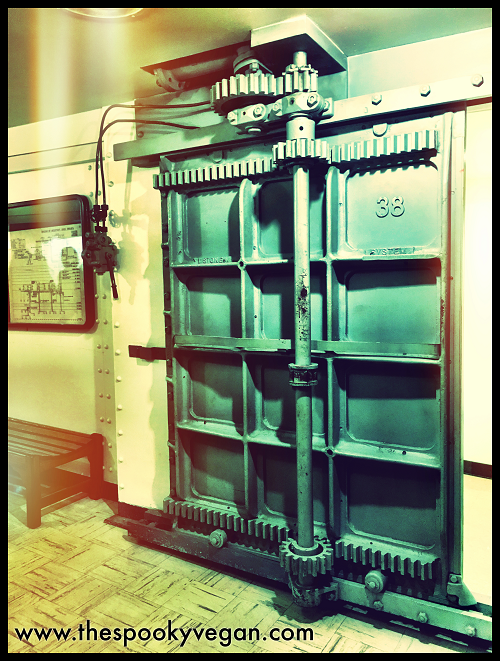 Today, remnants of this past can be felt along the passages of the ship, whether in grand salons, staterooms, or in the massive boiler rooms in the belly of the vessel. 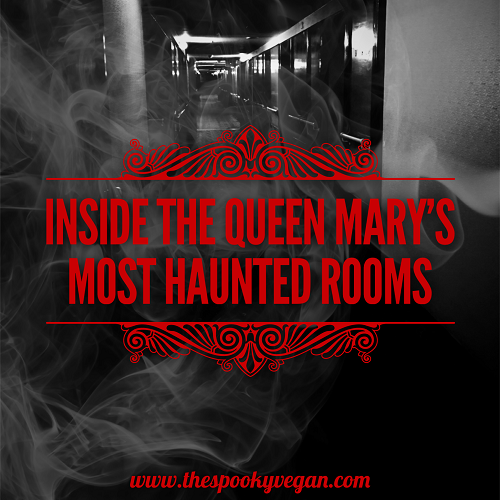 I have always been intrigued with The Queen Mary and the reported hauntings that seem so commonplace aboard the ship. 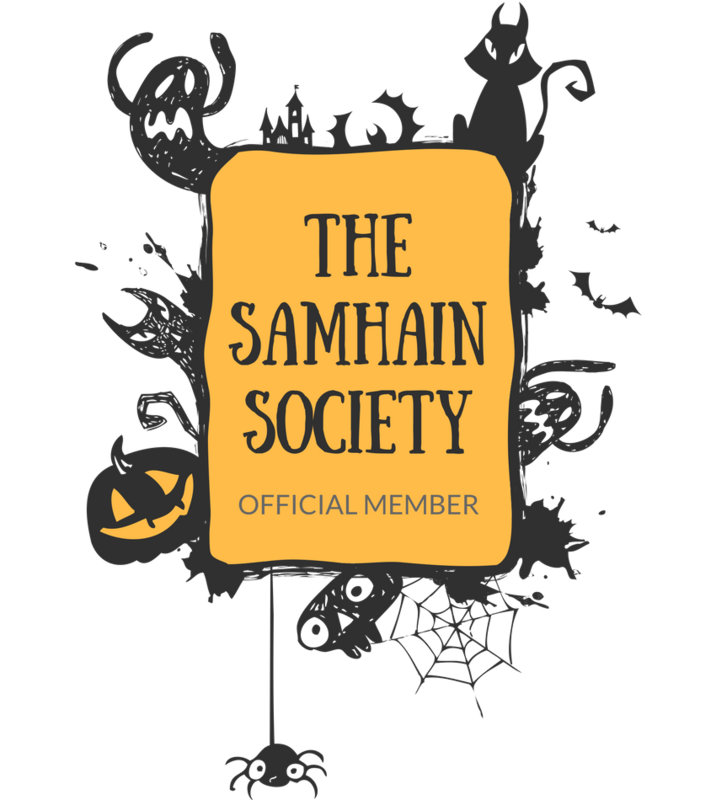 I have visited the ship several times and have attended events there, but I have not specifically gone there for their ghost tours, though I have always wanted to. 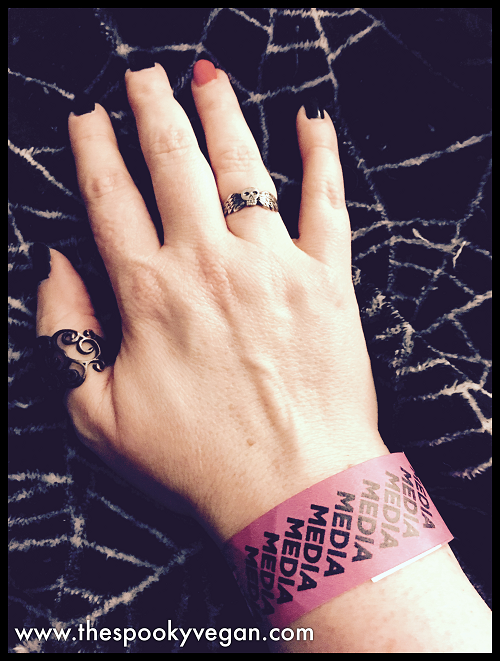 Well, last night in honor of Friday the 13th I had my chance as I was invited to attend a media sneak peek at The Queen Mary for the unveiling of their most haunted stateroom, B340, to the public. 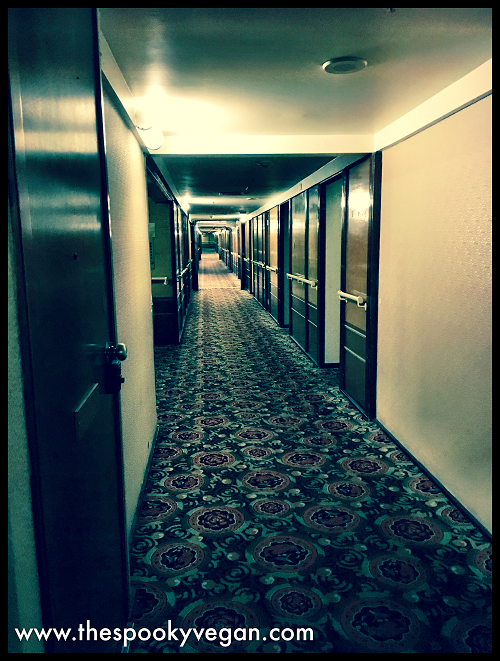 This stateroom had to be closed 30 years ago after excessive paranormal activity upset numerous guests. 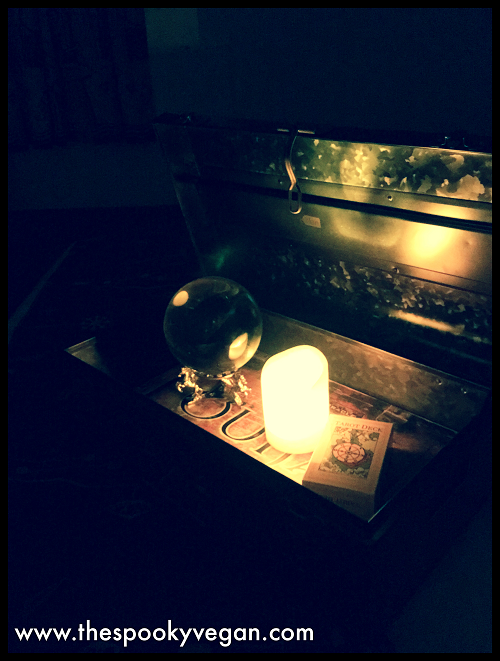 The stateroom has been closed for 30 years, but it is now open for guests to book...if they dare! accommodations and tours, as well as hosting numerous events. also adds to the eeriness. Our first tour was Haunted Encounters with our host with the most, Daniel. and heavy breathing behind them in this part of the ship. wearing an elegant white dress before vanishing. columns at guests. She is reportedly the ghost of a little girl who drowned. 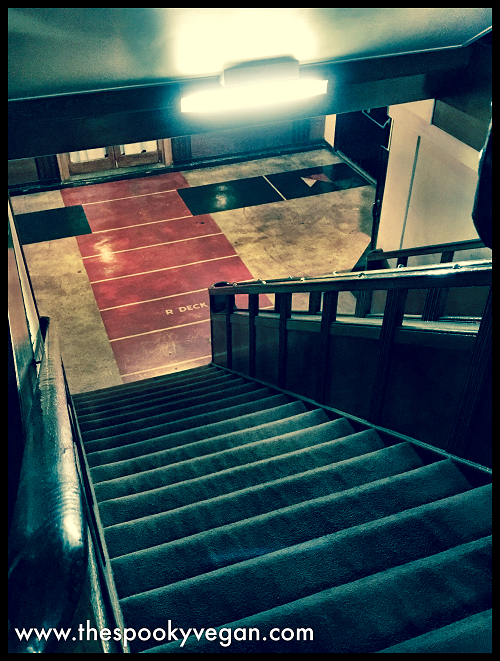 dapper man in older-style clothing has been seen near these stairs. 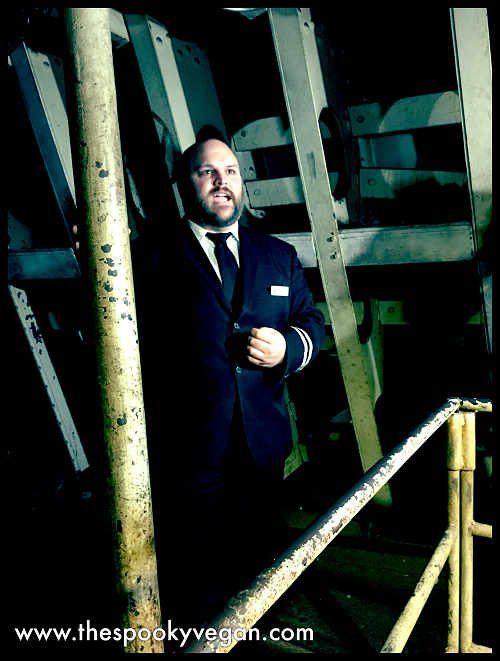 Our tour guide Daniel shared many more ghost stories with us at various locations on The Queen Mary. 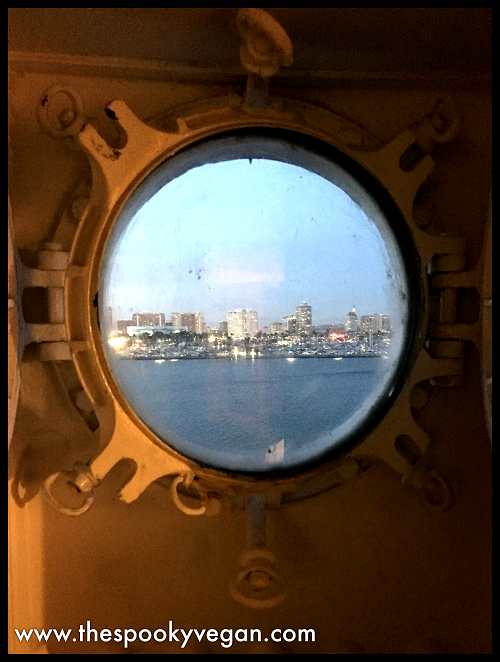 If you have never done the Haunted Encounters tour aboard the ship, I highly recommend it (and ask for Daniel as your tour guide, he was seriously amazing and added so much to the spooky fun!). 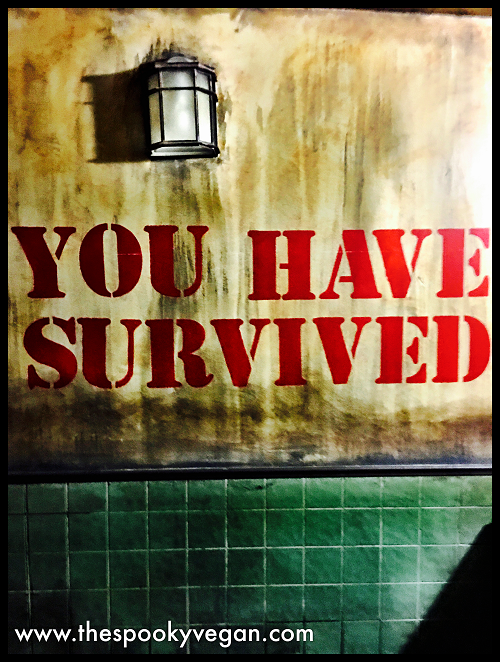 You can find more information on the Haunted Attractions Tour on The Queen Mary website HERE! 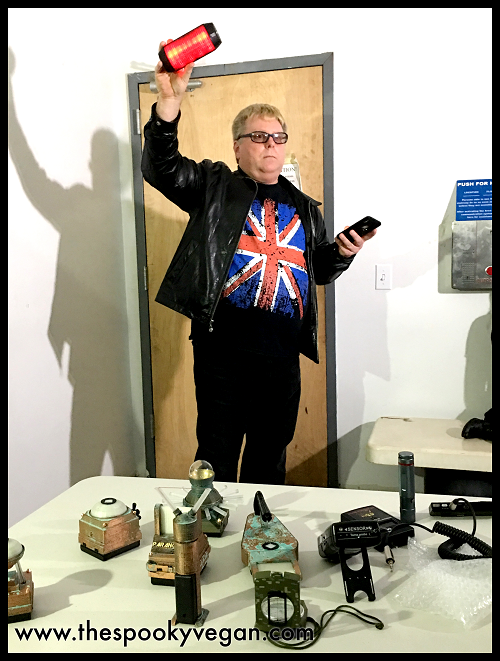 Next, we were treated to a Paranormal Investigation Tour with ParaXplorer Project founder Matthew Schulz. 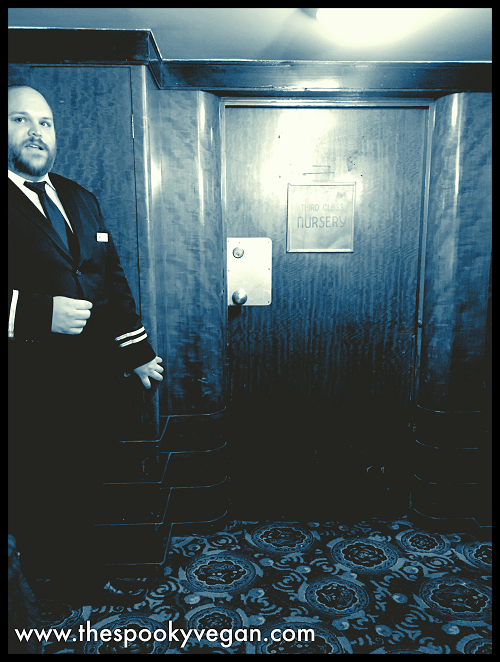 He lead us deep into the depths of The Queen Mary, into areas that have had extensive paranormal activity and are not available to the general public. 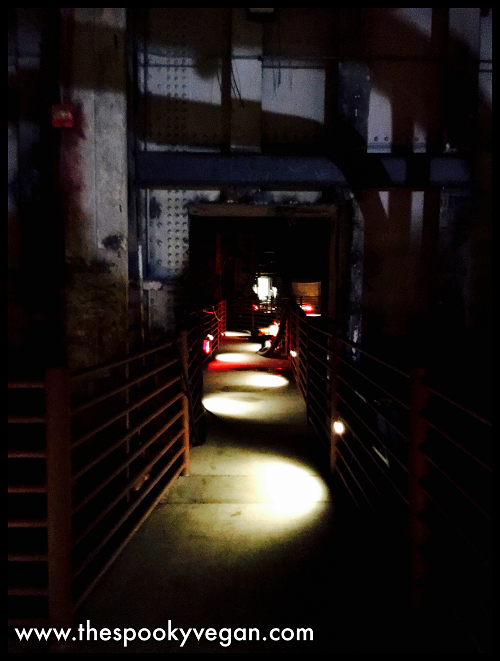 We got to explore the cavernous boiler room, which is several stories below the water level. 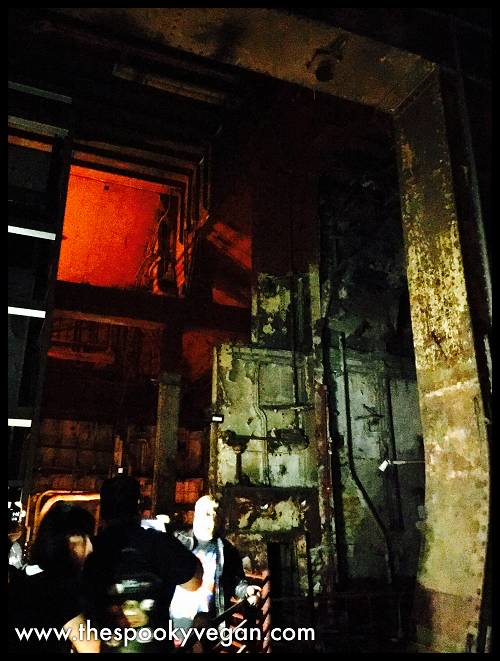 It was extremely spooky down there and I loved every second! 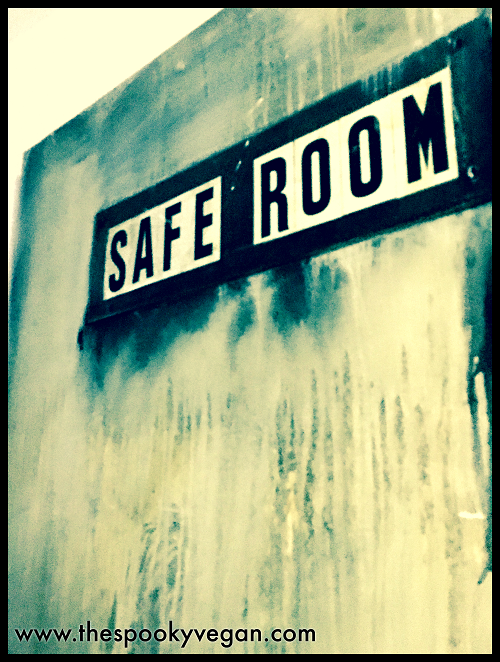 He lead us into the safe room where he showed us evidence from several investigations and we conducted an investigation of our own! we heard knocking, footsteps, a voice saying "get out," a voice responding "no,"
the photo is actually under the water level! 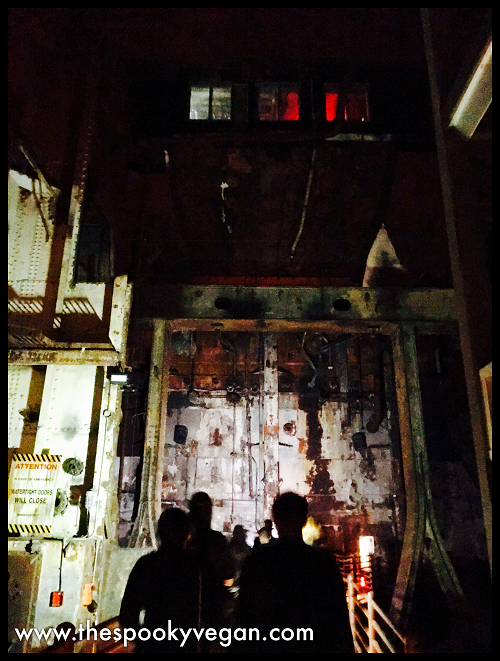 I didn't experience any paranormal occurrences during that tour, but it sure was neat to hear the recordings and check out the boiler room, which is off-limits to the general public. I'd like to go back and do one of the nighttime paranormal investigations aboard, I think it would be really interesting. You can find more info on this tour on The Queen Mary's website HERE! Taking a break in-between tours for selfies! 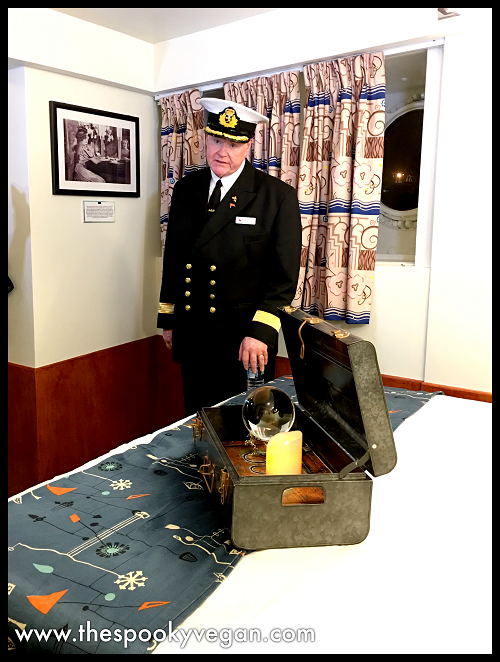 Next, we met up with Commodore Everette Hoard who led us to the main attraction, the infamously haunted stateroom B340! This room has been closed for 30 years due to the high volume of paranormal activity, including lights and water faucets being turning on and off, shaking beds, disembodied voices, and strange sounds. 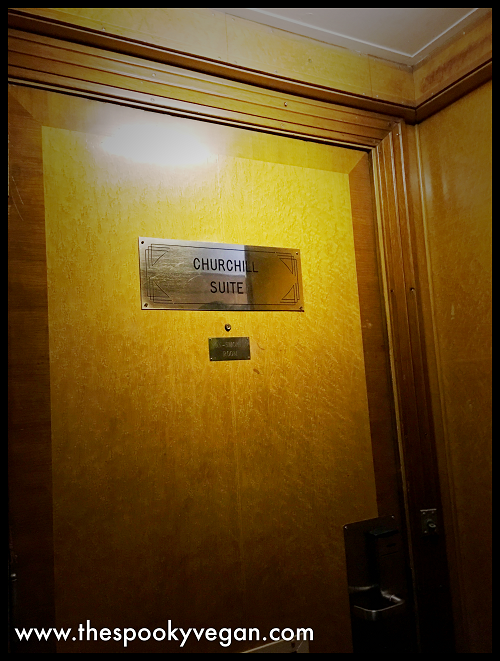 Complaints from this room were so numerous that it was closed and guests were not allowed to stay there...that is, until now. 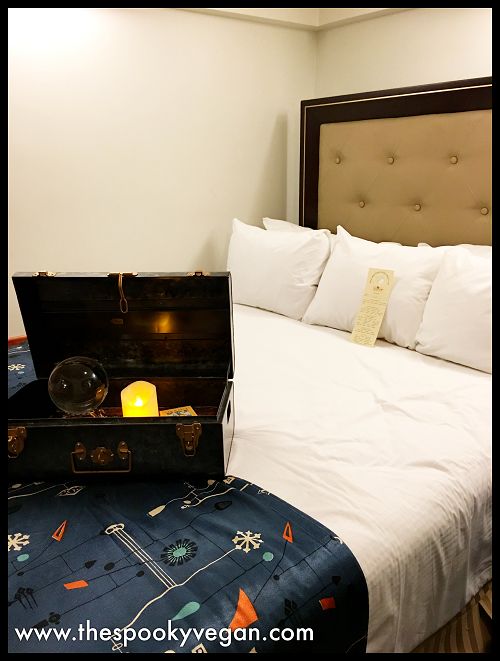 The stateroom has been remodeled and bookings for the room has been re-opened to guests brave enough to stay in this room. 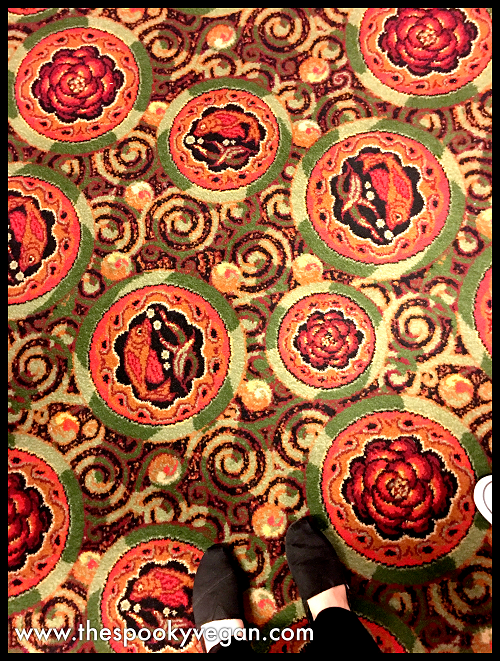 I have to say, I did feel a little nauseous in this room and my belly was doing flip flops while I was standing in there. Other people from the group complained of nausea, feelings of sadness and anger, sharp pains in their chest, and headaches. 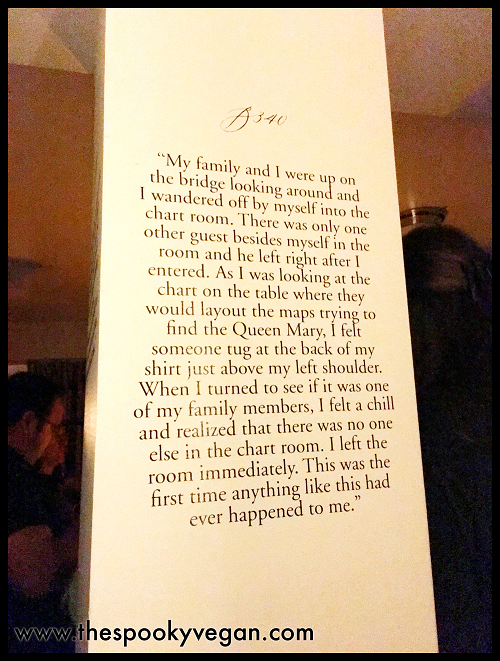 Commodore Everette himself said the room gives him vertigo and it was really hard for him to be in there. 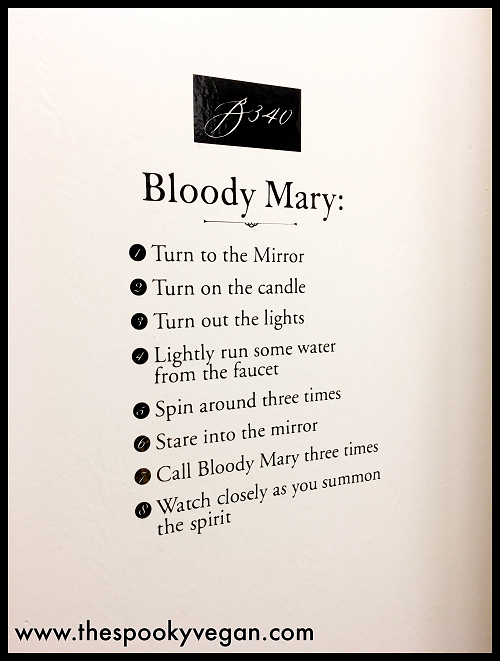 communicate with the spirits aboard The Queen Mary. This was an especially cute touch next to the bathroom mirror! 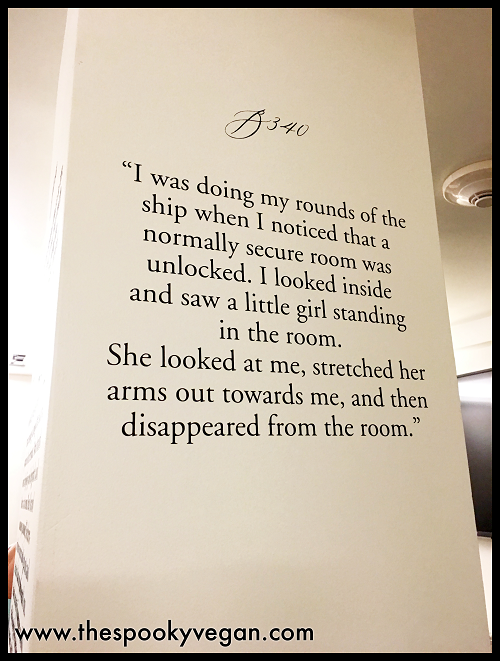 Would you stay in Stateroom B340? Whew, it was good to be home after an eventful night! 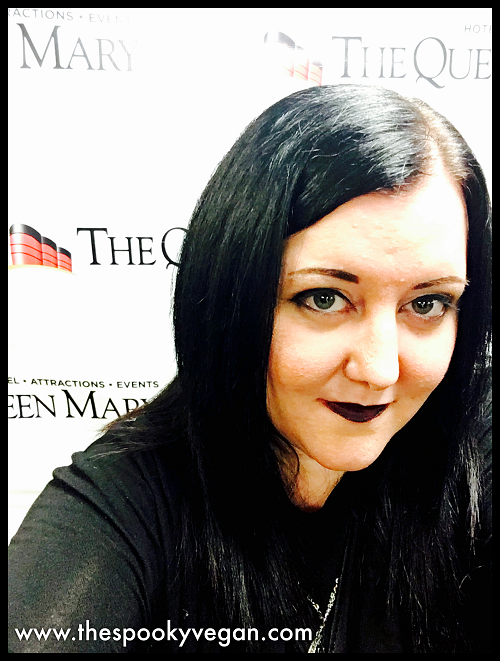 While I didn't experience any paranormal activity first-hand on The Queen Mary, I think the stories and eye-witness testimonies are very compelling and I would love to go back and take another ghost tour. I don't think I would be brave enough to sleep in Stateroom B340, though! 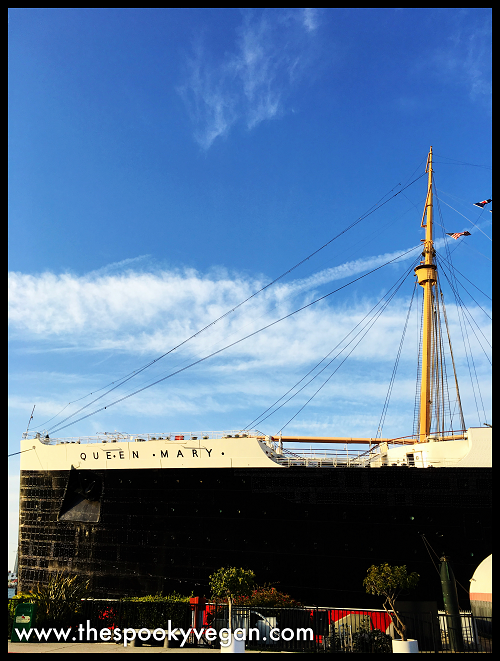 If you are in the area or planning a vacation to the area, I can't recommend The Queen Mary enough. It is full of rich history and is a must-see if you want the chance at a paranormal encounter or just like hearing ghost stories. They have multiple tour options daily, so I suggest checking out their website for more information! Stay spooky and have a haunting Friday the 13th! 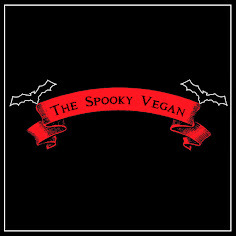 Hello to the Spooky Vegan: I LOVED this article and all your beautiful photos. 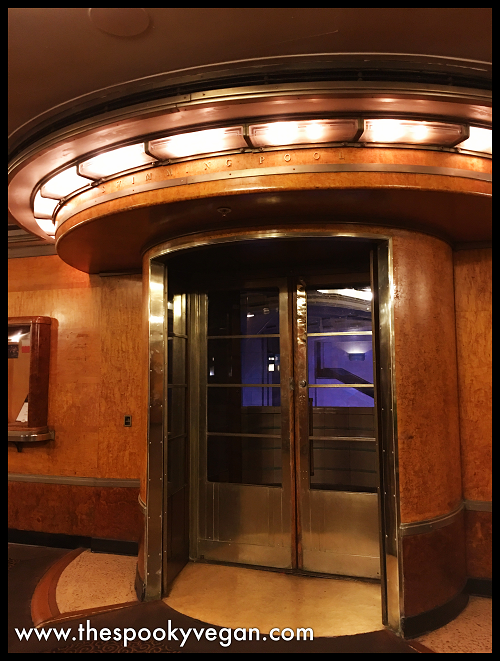 I've been a fan and a writer of the Queen Mary for a number of years now. (In fact, I even know the Commodore you've included in your post) You did a wonderful service to her by posting this fun article, and I'dd like to share this link, if I may? Also, I want to send you two novels which have been set aboard the modern day ship. I think you'll like them, but there's no obligation for you to feature them--I just would like to send you a present because you wrote this post. 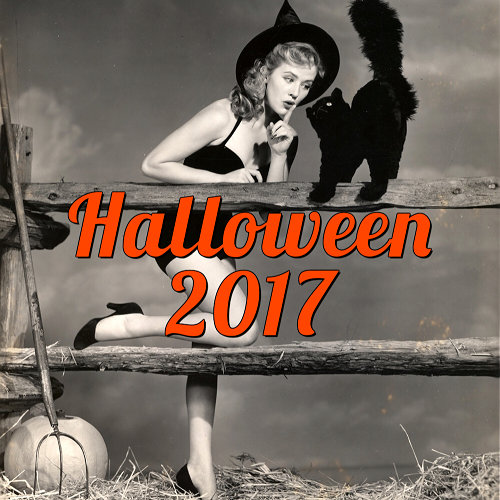 Let me know if I may share it on my Facebook page, and if you'd like the novels mailed to you, please email me your address at: patricia@patriciaVavis.com Thank you and HAPPY HALLOWEEN!